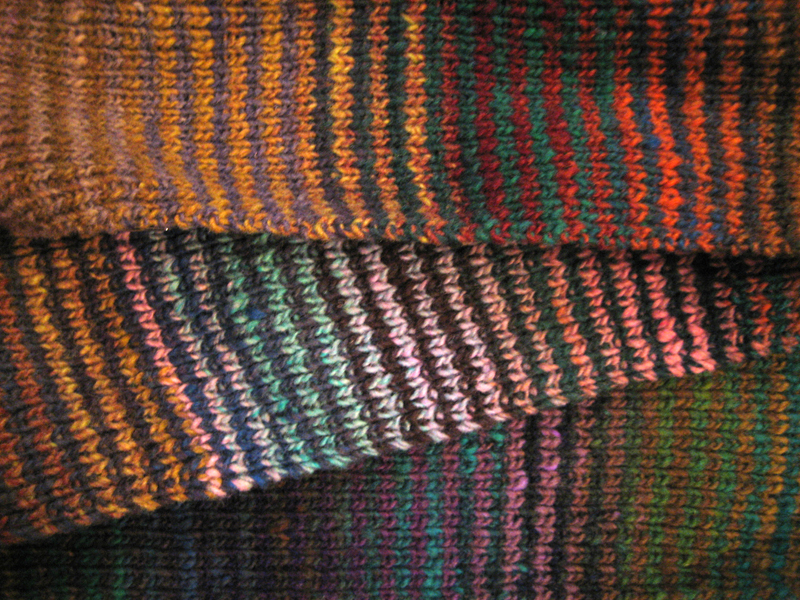 The Knitting Pirate » In Which the Pirate is Almost Done Striping. « In Which the Pirate Adds a Shiny. In Which the Pirate is Almost Done Striping. 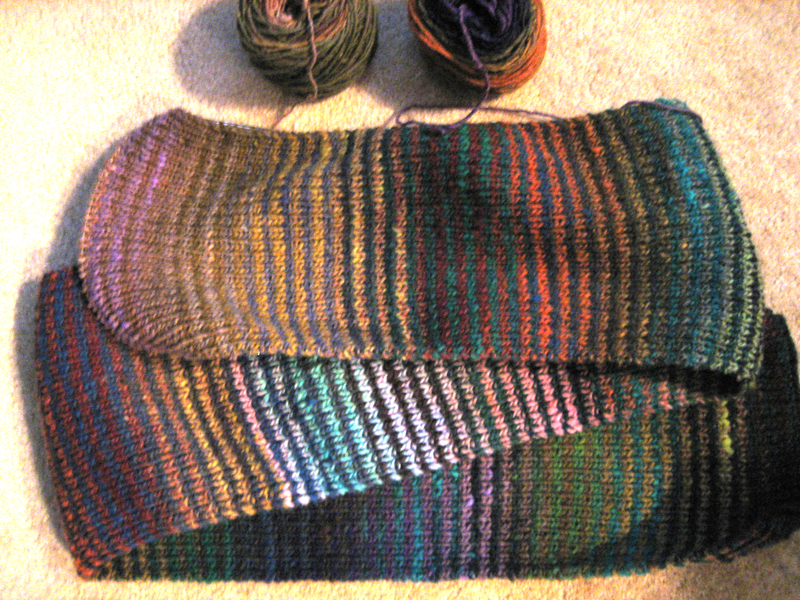 Here we have the by-now-infamous stripey striped scarf, hurtling towards completion. I may have already mentioned that there's 12-15 inches of scarf left to knit. It was up in the 90s yesterday (that's 'hot', for you Canadians) so it's nowhere near time to be wearing warm wool scarves... still, I'm looking forward to having it done. At the same time, I will miss the fun of seeing what colors come next and how they play out against each other. Maybe I'll have to do something stripy again soon. 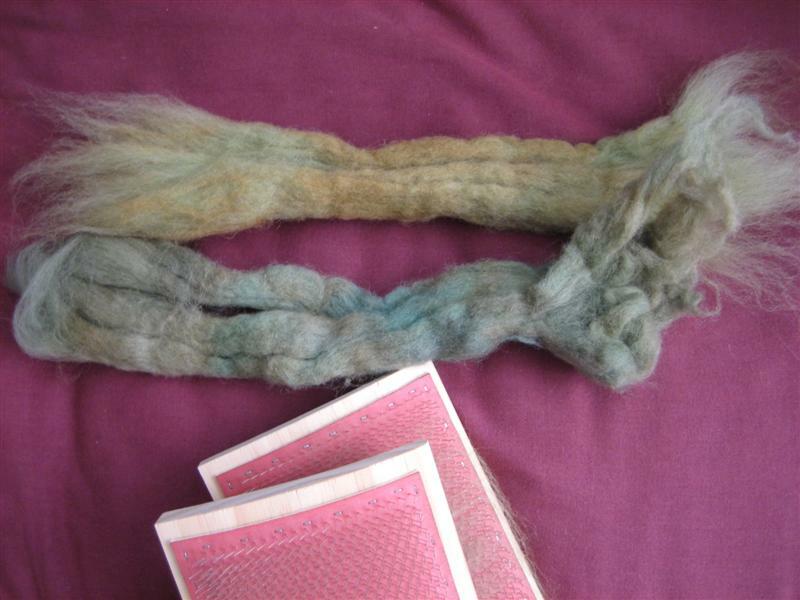 As my wrists allow, I've been working on carding the green roving. I thought it would never end, but I finished off the last of it after taking this picture. Pirate-Husband helped some, which surprised me a little, but he said he found it to be relaxing and meditative. Maybe I can get him to card for me in the future? I took a cardboard box, lined it with a black plastic bag, and put all the rolags in it. It's full to the top, so it's a good thing I'm out of wool that needs to be carded! 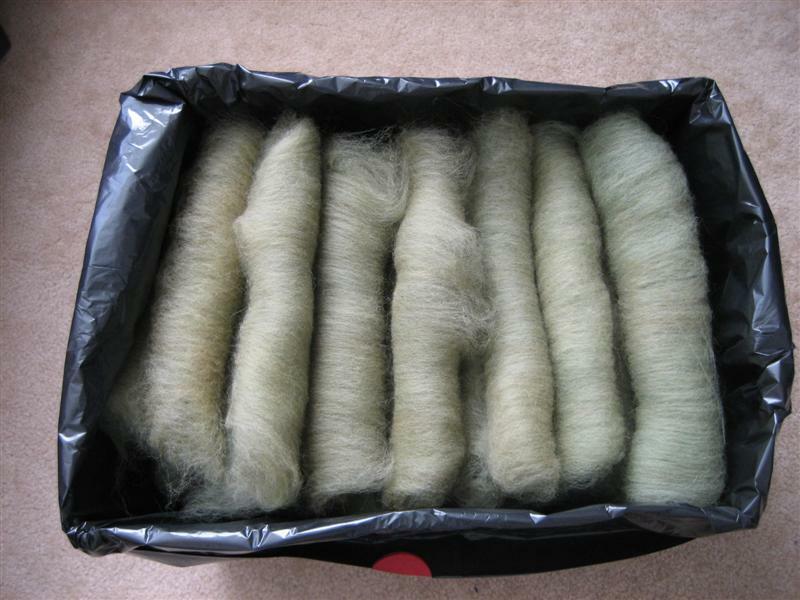 Next up is, of course, the Eight Pounds of Alpaca - but I think I'm going to hold off on carding that until I've spun some of what I've already got. First, the roving from MD Sheep & Wool. I think that would be the best to practice on. Then, the green stuff... and THEN the alpaca. This entry was posted on Wednesday, September 26th, 2007 at 11:07 and is filed under fiber, scarf, spinning, stripey striped scarf. You can follow any responses to this entry through the RSS 2.0 feed. Both comments and pings are currently closed.